Although sometimes decried by pundits, George W. Bush's use of moral and religious rhetoric is far from unique in the American presidency. The Moral Rhetoric of American Presidents astutely analyzes the president's role as the nation's moral spokesman. Drawing on quantitative and qualitative methods, Colleen J. Shogan demonstrates that moral and religious rhetoric is a strategic tool presidents can use to enhance their constitutional authority. 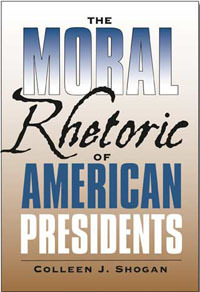 To determine how the use of moral rhetoric has changed over time, Shogan employs content analysis of the inaugural and annual addresses of all the presidents from George Washington through George W. Bush. This quantitative evidence shows that while presidents of both parties have used moral and religious arguments, the frequency has fluctuated considerably and the language has become increasingly detached from relevant policy arguments. Shogan explores the political effects of the rhetorical choices presidents make through nine historical cases: Presidents Washington, Jefferson, Madison, Buchanan, Lincoln, Theodore Roosevelt, Kennedy, Lyndon Johnson, and Carter. Shogan highlights the specific political circumstances that encourage or discourage the use of moral rhetoric. Shogan concludes with an analysis of several dilemmas of governance instigated by George W. Bush's persistent devotion to moral and religious argumentation. COLLEEN J. SHOGAN, who holds a Ph.D. from Yale University, is an assistant professor of government at George Mason University. She is the recipient of the American Political Science Association Congressional Fellowship.